AR+E stands for the Applied Research and Evaluation Team. We are similar to the Mission Support Team in that our role is to support the work of the Center for Family Development (FD). Help educators make data-informed decisions about their programming to improve and maintain effectiveness. Highlight and demonstrate the value of FD's programming to a wider audience. Provide accurate and reliable systems of accountability and monitoring that can stand up to outside inquiries. We have four priorities in allocating our work. The team's top priority is to make sure that FD meets all of our evaluation and research obligations to satisfy the requirements of our funders. Funding comes from both the federal government through the U.S. Department of Agriculture and National Institute of Food and Agriculture (NIFA) and from the Minnesota Legislature. Every year when we talk about federal reporting time, or ask you to enter data about who you reached in your programming and what the impact was, that information gets rolled into our federal report back to NIFA. Other major grants for which the team prioritizes support are SNAP-Ed and EFNEP. Both of these funding streams require specific types of data collection and reporting. In fact, each year we submit to our funders a document called the “SNAP-Ed evaluation narrative.” This document outlines what evaluation and research activities we will embark on — and report on — over the coming months and years. So a part of our job is to make sure that happens. Then we sometimes help people apply for grants and support them through the process. Examples include the CYFAR Partnering for School Success grant that just wrapped up, our current Latino Fathers Promoting Healthy Youth Behaviors project, our current work to apply for the Foundation for Food and Agriculture Research Tipping Points grant, and smaller grants like the one Extension Educator Antonio Alba Meraz received from the Consulate of Mexico in Saint Paul. Sometimes grants look more like a contract for services with an outside entity. An example of these include Family Resiliency’s new contract with the Minnesota Department of Corrections (DOC) to teach parent education in several Minnesota prisons. The hope is that by providing high-quality evaluation and reporting (in addition to excellent parent education), the DOC would ask to renew the contract. This would allow FD to continue to meet Extension’s mission and connect with an often marginalized, hard-to-reach group — fathers who are incarcerated. Income-generating programs are another category of programs that the AR+E Team supports. These programs include Parents Forever and Systems Approaches for Healthy Communities. A pragmatic reason why these types of programs get support is that the added income provides more resources to our team, and the more resources, the more capacity we have to support all of FD. Another reason to prioritize these income-generating programs is that some of FD’s funding streams are highly specific. So if a research assistant, for example, is being paid to support SNAP-Ed, he or she needs to support programming and projects related to what is written in the SNAP-Ed evaluation narrative. In contrast, income from Parents Forever can be used for non-program related expenses, at the discretion of leadership. Scholarship can take the form of journal articles and conference presentations and posters, which the AR+E Team supports. It can take other forms, too, such as peer-reviewed community-oriented scholarship. CYFC’s eReviews are a great example of this kind of scholarship: Children’s Mental Health eReview. FYI: The AR+E Team is not involved with production of CYFC eReviews, but I offer it here as a great example of peer-reviewed scholarship that is not a traditional journal article. The AR+E Team works with program leaders to identify who will go up for promotion within the next year or two. We then try to support any scholarship efforts of those Extension educators. Sometimes that support is more reactive, such as helping with data analysis. Sometimes it’s more proactive and we work together regularly throughout the process, from start to finish, to get papers and presentations out the door. We also generally place a priority on any scholarship about FD work because we believe that this helps others in the wider research community and Extension world learn about and from our programming. So we are willing and excited to support all staff in their scholarship efforts, as long as we have capacity to do so, particularly for projects and programs that would benefit the most from more exposure (as identified by program leaders and supervisors). For example, in the past we have supported annual reports for the Latino Financial Literacy Team. The AR+E Team's fourth priority area is supporting educators in using evaluation techniques throughout the program life cycle, from initial idea to continued implementation and adaptation. We want all of the programs FD delivers to be effective and high-quality. We also support educators in their efforts to improve and adapt their programs to meet changing audience needs and experiences. Projects and tasks related to the AR+E Team's four priorities rise to the top of our list, but we also do lots of other things by request as we have capacity to do so! Our time is a financial investment by leadership in FD’s mission and promise, so making sure that your request is in line with your program leader or supervisor’s vision of the coming year’s plan of work is a good first step before reaching out. Support for conference presentations and journal articles. Qualitative (words and text) analysis support — for an example, see the blog post Jam Those Data! (Jam Them Good): Qualitative Data Analysis and Data Jamming. Support and consultation for developing evaluation tools, measures, and protocols. Grant preparation support — for a review of the basics, see the blog post Got Grants? GIS mapping support — for a review of the basics and an example, see the blog post Understanding the Power of GIS Mapping. 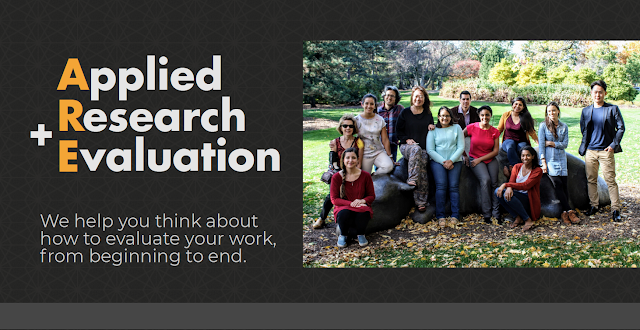 Our team is made up of five full-time staff and several graduate research assistants. See the complete list with bios here: FD Applied Research and Evaluation Team. If you have access to the FD intranet, check out our Meet the Team infographic. Please contact any AR+ E Team member for assistance. (If it’s a big request, please check with your supervisor or program leader first.) If you don’t know who to reach out to, email or call me, Emily Becher, and I will make sure your request is addressed and gets to the right person. This interactive newsletter provides news, updates, and reflections from Extension Center for Family Development. We encourage you to comment or ask questions in the comments field below each article. Questions about this newsletter? Feedback? Tell us at family@umn.edu.